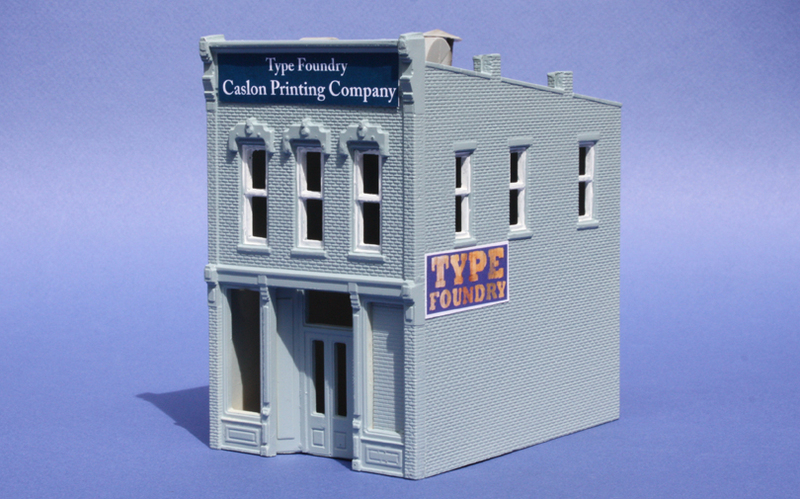 modeling the SP: What’s a type foundry? Foundries doing this kind of casting once abounded throughout Europe and in the U.S., so could I model one? But before thinking about modeling, let’s consider a little history. For centuries after Gutenberg, type and printing changed only slightly, but in the late 19th century, printing by setting of individual pieces of type began to decline. That was because in 1886, the first successful Linotype machine went into use. Invented by Ottmar Mergenthaler, it soon had competition from a similar-concept machine called Monotype. Both could output entire lines of type (thus the name) as a single slug, and were immense labor savers for big-volume typesetting businesses like newspapers and book printers. Within two decades, large printers universally used one of these two slug-setting machines. Smaller printers, especially local job printers, continued to hand-set type from individual pieces of type. Meanwhile, the American Type Founders Company was formed in 1892, as an amalgamation of 23 smaller foundries. For the first two years of ATF, all those existing foundries pretty much continued in business, merely using the ATF name, but starting in 1894, a rigorous weeding out of duplicate and inferior typefaces was done, along with closing the smallest and least efficient foundries, in favor of eight regional foundries, chosen from among the original 23. But poor business conditions in the middle 1890s, and the fact that some of the eight chosen survivor foundries were not actually as efficient as desired, led ATF in 1903 to close all but one foundry, their plant at Jersey City, New Jersey, with offices in Boston and Manhattan. Later their foundry activities were moved to Elizabeth, New Jersey. For both ATF and surviving smaller type foundries, it was essential to market new and different type faces, to obtain sales in a declining market. Partly for this reason, in the 1920s emerged a kind of golden age of advertising and promotional printing. Many new and eye-catching typefaces were created, a perfect product for type foundries, because even though type rarely wore out in small job shops, you had to buy the newest faces to keep up with advertising ideas. Thus smaller foundries, along with ATF, thrived in this period. But the Depression greatly changed that, as did World War II, an entire period with far fewer new faces, and less advertising printing. Other parts of ATF’s business included the sale of printing presses, along with printer’s supplies, and they offered repairs for printer’s and bookbinder’s equipment. But they, like the few small foundries still operating, were in dire straits by the 1950s. Phototypesetting had emerged as an even faster and more accurate process than Linotype, particularly as offset printing replaced letterpress (type) printing. New typefaces were not always even produced in metal type any more. Only a few stubborn foundries, and a few associated with printing plants, continued in business. 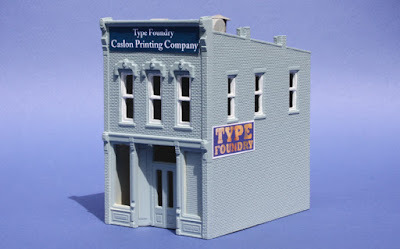 I wanted to include such a business on my layout, and since an independent foundry was fairly unlikely by my modeling year of 1953, I decided to make it an adjunct to a printing business already on the layout, Caslon Printing. This also simplifies any rail-delivered freight for the foundry, because it would be received by Caslon at their receiving dock. 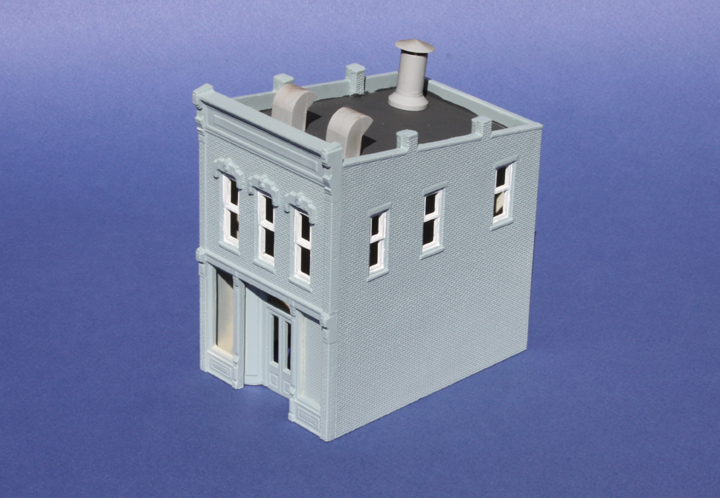 I chose to use a Design Preservation kit, named “Kelly’s Saloon,” as the structure. Here is that structure, painted but not yet weathered or given signage. The original sills and lintels here are represented as molded concrete, but because the model represents a non-foreground industry, I have done it as though the painters just painted everything, bricks and concrete, the same color. Note also I boarded up one of the ground floor front windows. 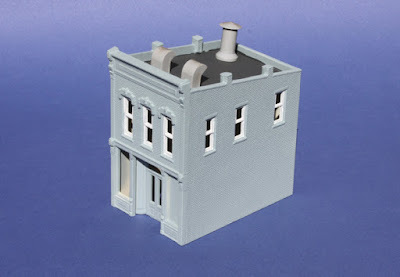 Lastly, the various roof appliances are from the Walthers “Roof Details” set (their number 933-3733), though the four little side chimneys are part of the Design Preservation kit. It might be wondered whether this building is too small to house a type foundry. But such foundries can be quite small indeed. For example, at the justly renowned Plantin-Moretus Museum in Antwerp, Belgium, a former printing company, the type foundry is a single room, dating to the 1620s. Only a couple of small furnaces and some working surfaces are needed for the process of hand-casting individual pieces of type. I visited this room and greatly enjoyed doing so, as I posted some time back (you can see that post at: http://modelingthesp.blogspot.com/2012/02/type-and-typography-foundations.html ). For more on the Museum itself and its remarkable history, you may enjoy the Wikipedia entry (the entry can be found at this link: https://en.wikipedia.org/wiki/Plantin-Moretus_Museum ). 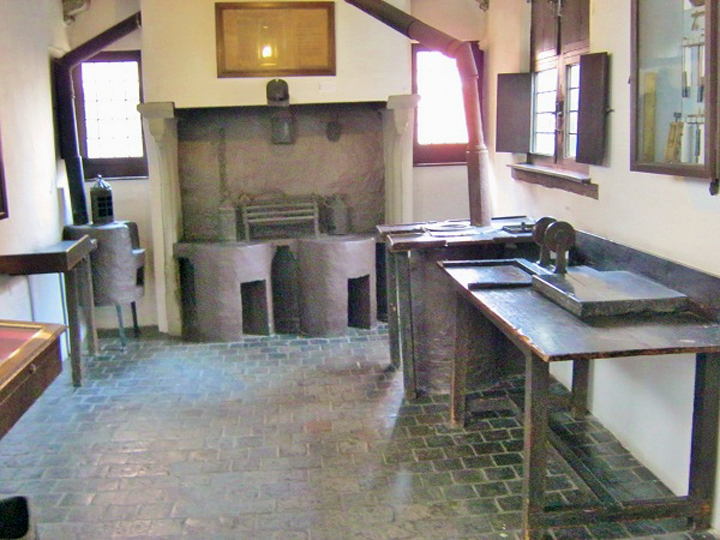 The photo below, from Exeter Working Papers in Book History, shows the Museum’s type foundry room. 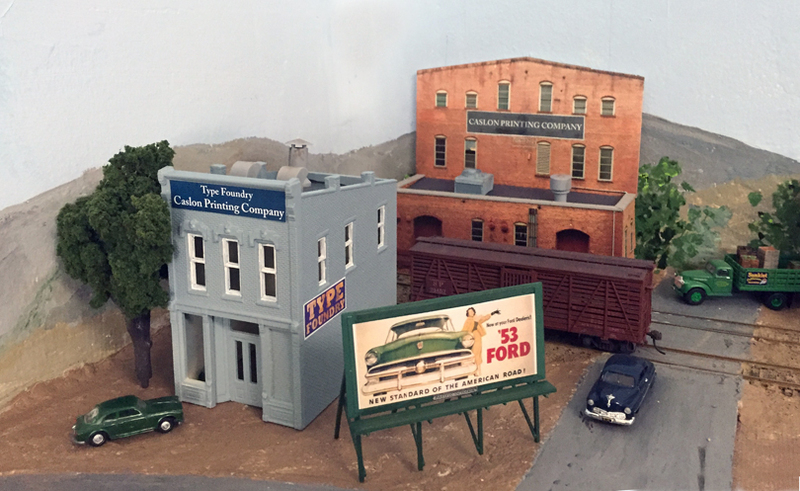 In fact, given how little space was needed for the casting work, it is likely that much of any additional space would be used for storage of raw materials and finished type fonts, along with office space, etc. The idea of having a type foundry as part of my printing business is interesting to me, partly for typographical history reasons, and does serve to generate additional inbound loads of materials for the foundry as part of Caslon Printing. I will see how it works in future operating sessions. While they didn't do type foundry work, Knights Foundry is open to the public again in Sutter Creek (all water powered). They hope to have a furnace operational soon so they can start casting again but most of the equipment dates from pre-1900's. Worth the trip.